Home Yeh Rishta Kya kahlata Hai Yeh Rishta Kya Kahlata Hai 22nd June 2018 Episode Written Update "Naira-Kartik's Pool Moments Captured in Camera"
Yeh Rishta Kya Kahlata Hai 22nd June 2018 Episode Written Update "Naira-Kartik's Pool Moments Captured in Camera"
episode starts with Tanvi runs to inform Kartik about Dadi’s injury. He apologizes to her and leaves from the college to see Dadi. He feels Naira has done wrong to make the students protest against the college management. Naira gets Dadi admitted in the hospital. She helps the doctor treat Dadi by sharing her medical history. Doctor thanks her and tells her that Dadi will get conscious soon. Naira asks Dadi how is she feeling. Doctor tells Dadi that Naira remembers her medical history well and helped them treat. Kartik gets a relief on seeing Dadi. He misunderstands Naira. Naira makes a leave. Kartik yells at her and accuses her for spoiling the things. He tells her that Dadi got hurt because of her protest. She clarifies that he didn’t take strict action on time and this is the result. He tells her that he is solving things, but she has provoked the students against him. He scolds her for not caring for anyone. He reminds her Shubham’s death which happened because of her negligence. He tells her that he doesn’t want the past to repeat. Naira breaks down by his accusations. Naitik awaits her and tries to know if she is fine. Naksh calls up Naitik to share his problems, and hears him just concerned for Naira. He gets angry on his fate. Naitik thinks of calling Naksh, but fails to reach him, since Naksh breaks his phone in anger. Manish tries to relieve Suwarna’s tensions. She explains her worries for Kartik, since he is away from her. He asks her to change like before, since he misses his supportive and understanding wife. He asks her not to burden Kartik with her fears. Naira informs Tanvi that Dadi is fine. She asks Tanvi why is she scared. Tanvi thanks her for the support. She reveals her family tensions post the MMS scandal. Naira doesn’t want Tanvi’s reputation to spoil. She tells Tanvi that she will explain the trustees. Kartik overhears their conversation. Naira encourages Tanvi to face the situation and be strong. Kartik misunderstands her again. He gets arguing with her and tells her that she can’t run always. They accidentally fall in the pool. She hugs him out of fear of drowning. Someone shoots their MMS. Later, Naira learns about Kartik’s action against the students who protested. Dean decides this, but Kartik gets misunderstood by Naira once again. Naitik tells Naira that she should talk to Dean and complain against Kartik. He encourages her to fight back. 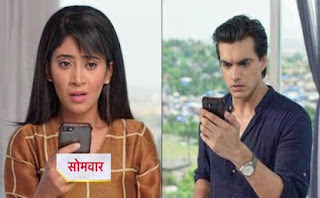 Naira then receives a video and learns that Kartik also wants to punish the culprit. The culprit makes Kartik and Naira’s MMS and sends them the video with a threatening message. He asks them to drop Tanvi’s case, else they will be defamed next. They receive a huge shock.